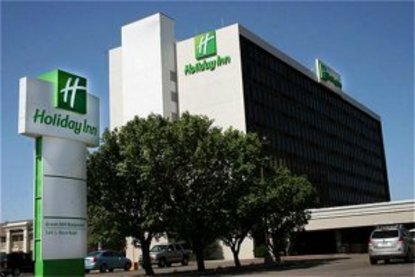 Holiday Inn Select Hotel Wichita Kansas 9 story w/cabanas by outdoor pool. Indoor pool, Jacuzzi, exercise room. 100% non-smoking as of 7/15/08.Facility will be 100% non-smoking as of 7/15/08. All tower & public meeting rooms non-smoking at present.Free business center.Priority Club Members receive 20% off in Green Mill Restaurant & $5.00 allowance daily, managers reception every Wednesday 5 PM - 7 PM. Free wireless Internet, free cable access in select rooms & business center, ATM, business center, hot spot. Location: hotel is southeast side of Wichita. Corner of Rock & Kellogg (US 54/400), by Town East Mall, many restaurants in 3 mile area, 1 mile to Interstate I-35. 5 miles to downtown, 11 miles to airport. Businesses: Boeing, Bombardier Aerospace Learjet, York International, Hawker Beechcraft, Yingling, Koch Industries, T-Mobile, Textron, Cornejo & Sons, Cargill-Excel, Mcconnell AFB, Dillon Food Stores, Wesley Medical Center, York International, SBC Communications, Coleman Co, Mid Continent Cabinetry, Engenio Information Technologies, CNH Manufacturing, Westar Energy, Vulcan Chemicals, Burlington Northern & Santa Fe Railway, Wescon Products, Spirit, Flight Safety International, Aeroflex. Universities: Wichita State University, Friends University, Newman University, Southwestern College. Sports Facilities: Stryker Soccer Complex, Folgers Gymnastics, Koch Arena, and hike/bike. This hotel is committed to providing accessible facilities under the American Disabilities Act. If your accessibility needs are not met, please contact the Hotel Manager on Duty. Should you require additional information regarding accessible facilities for guests with disabilities, please call 1-800-Holiday (U.S. and Canada) or contact the hotel directly. For the hearing impaired, TDD service is available at 1-800-238-5544 within the U.S. and Canada.